Weiser Motorrad LLC. Manufacturer of specialty motorcycle accessories, known in the industry for it’s popular ‘Ultra Bright’ LED turns signal inserts, for most BMW motorcycles and also many models for, Triumph, Aprilia, Moto Guzzi, Ducati and CanAm, adds to it’s line up of premium products. Weiser Motorrad has launched this initial range with 12 designs, featuring images such as the most popular “GS” and “Dakar” inspired designs and also includes, Zebra, Leopard & Cheetah prints in recognition of motorcycling’s “long way adventures”. Also included are designs for the British Union Jack, Stars & Stripes and many other designs. “They offer superb protection to exposed paintwork and metalwork that will last, while creating a level of individuality never before available for the GS range of motorcycles. We are very excited by the response of GS owners and dealers who have seen the product. There is nothing on the market that does what this product achieves,” says Mark Atkins, President of Weiser Motorrad Ltd.
Weiser Motorrad LLC. 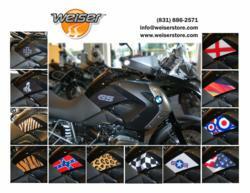 Sells direct to dealers across the USA and in the UK as Weiser Motorrad Ltd. Products include accessories for the popular BMW R1200GS such as the Weiser Heel Guard, Oil Cooler Guard, ‘Ultra Bright’ LED turn signal inserts, GS Pivot Covers now adding to the line up with it’s attractive line of protective graphics.